The Dremel Idea Builder 3D40 comes ready for use from the box. The printer is suitable for beginners and provides excellent prints. However, you will be restricted to using Dremel’s filament. Check the printer price on Amazon. Dremel is a household name that has been making DIY electrical tools from the 1930’s. Over the years, the quality of its products has made the company a well-respected brand. Dremel played an active role in 3D printing even before it became mainstream. Most of their tools are used by consumers to round off their work or remove their printed part from the build plate. There was no reason why this company should not start producing its own 3D printers, like it does now. The first Dremel 3D printer was launched in 2014 and was aimed at home-based consumers. Just like they did with the tool business, the company brought the same level of trust and reliability in their printers. The Dremel DigiLab 3D40 is a great upgrade from the previous 3D20 model. 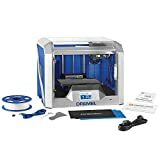 The Dremel DigiLab 3D40 Idea Builder is a state-of-the-art 3D printer. The printer has been significantly improved and has new features not available in its predecessor. This time, Dremel listened to the customer feedback and applied it to their printer. The new features are not only useful also innovative. One of the biggest changes with this printer is on to the build plate size, which is now 10″ x 6″ x 6.7″ inches. The size is one of the biggest build volumes in this class. The ability to remove the build plate when your prints are finished gives you the peace of mind that you won’t damage any internal parts when removing your object. Moving around in the cramped space to remove your build can be really frustrating, especially when you are new to 3D printing. Educators can get two build plates when they opt for the education package. With two plates, you can move faster from one print to another without having to put your printer on idle. While one print is being removed from the build plate, you can insert the next one and start printing immediately thereafter. With the previous Dremel 3D printers, you have to do the bed levelling manually. With the DigiLab 3D40, everything is automated. Dremel refers to this technology as Quick Level. You can follow along on the colored LCD touch screen to go through the setup process. Turning a notch here and there will give you a green check on the screen when the setup is done correctly and as indicated. The whole process will take you nothing more than a few seconds. From there, you can start printing your 3D models. If you struggled with clogs on an extruder before, this printer is clog-resistant. Clogging is one of the biggest reasons that 3D prints often fail. Running out of filament? No problem, the Dremel Idea Builder printer will pause your print when it detects that you are running low on filament. This is an economical feature as you won’t have to get rid of the half-finished print and use a new filament to start all over. Anyone that has had this experience before knows how frustrating and expensive it can be. Dremel has added Wi-Fi capabilities to this printer to make the 3D printing process easier. The Wi-Fi connectivity works well with Dremel’s own software, which you can use to send your models to the cloud to print. Some of the popular connection methods are still present in this model, including Ethernet and USB. If you have your 3D printer in another room, you can use the SD-card slot to transfer your files. Improvements have also been made to the lid. You can now keep the lid up when you want it like that. In general, the printer has a sturdier design that compliments all these new changes. There are two different packages offered by Dremel that you can pick. These are the standard and educational versions. With the educational package, you get 2 additional filament spools. In total, the educational package has 3 filaments while the standard package only has one. The spools are sold separately but are way cheaper when included in the education package. Another addition to the education package is a second removable build plate. In a fast-paced environment like the classroom, it makes sense to have more than one build plate. The additional plate will allow you to quickly move from one printed object to the next. Dremel continues to strengthen consumer trust with the easy setup process you’ve been used to since the days of their power tools. Unboxing the 3D printer is an enjoyable experience. Even though the packaging is sturdy, you’ll still find it easy to remove the wraps from your printer. Dremel is very generous and ships various extras with the printer. Besides the free filament, you get a USB drive with their software and some example files. There is also a removal tool for getting your objects from the build plate and a tape to help your first layer stick better. Everything else is just what you’ll get with all other 3D printers, ranging from cables to different instruction manuals. Dremel’s years of producing customer power tools really pay off if you look at their user manual. The manual comes in three different languages; English, French, and Spanish. By following the manual, you won’t take long to get through the setup and start printing. Mostly, you will only need the Quick Start guide. However, if you want more clarity, you can go through the more detailed guides included on the USB flash drive. After finishing the quick setup process, it’s time to get printing. Accessing Dremel’s software is easy since it is a cloud-based platform. You only need a computer with internet access and a working email address to create an account at the platform. With this, you’ll be all set to start printing objects. As a newbie to 3D printing, you will definitely run into one of the most common problems: getting your first layer to stick to the building plate of your printer. If this happens, you will end up with a failed build. Dremel includes some blue painter’s tape and BuildTak surface to help you get that first layer to stick. The company gives you some options when it comes to choosing your first layer adhesion. With one of the biggest 3D printing headaches out of the way, you should be printing flawlessly. After registering your Dremel software account and logging in, you can choose one of the models or upload your own design to the platform. Everything you’d want from 3D printing software is included here, including infill types, layer height and extrusion speeds. Beginners will benefit a lot from this program since the most part of it is automatic. When you become more skilled at 3D printing, you can change some of the manual settings to get the best results from your printer. Among the manual tasks you can carry out is the build supports that you’d need for some of your 3D objects. Dremel has an extensive collection of 3D models on their website that you can choose and modify. The existing models like phones cases or key chains can be modified before printing. If you want something unique quickly, using the available models would be a good start. Therefore, you don’t have to know a lot to be creative and get good results. The noise levels of the DigiLab 3D40 printer is low and acceptably quiet. There are two key factors that contribute to the 3D40 printer being as quiet as it is. These are its enclosed design and improved sensor technology that does not let the extruder travel further than it’s required to. This printer can be kept in an office. However, you should avoid doing this as you get easily distracted. A ringtone soundlike notification is produced when your print has finished. You can then open the encloser and remove your print from the build plate. A big positive for this printer is that you don’t have to remove the prints inside the printer. Instead, you can remove the mobile build plate and remove your object with as much freedom as you need. Therefore, you don’t have to worry about possibly damaging any of the printer’s internals. With the default settings, you’ll get a satisfying 200-micron layer. Printing with the minimum layer height of 100 micron doesn’t change much, except the time it takes to complete your build. The Layer definition is acceptable and at 100 microns, you’ll get a smooth finished product. Therefore, you will be using the filler and sand sandpaper less often. If these factors do not concern you, you can finish your prints faster by switching to 300 microns layer height. The 3D40 keeps clogs and spider webbing to a minimal. It’s very rare to notice clogs or spider webbing and when you do, it won’t be too bad. Any post-processing of your models is also kept to a minimum. The features and specifications of this printer indicate it’s solidly aimed at beginners. Children and teenagers will benefit from the press and print functions of the printer before they move on to manually tweaking settings. Dremel had to make some sacrifices along the road to make the printer more beginner friendly. One of these sacrifices is the inability to use third-party filaments. To get around this, it would be best if you print a spool that is slightly bigger than the one Dremel includes on the printer. Even though you won’t be able to use third-party filaments out of the box, you can contact Dremel’s customer care to help you with a solution. The quality of the PLA Dremel provides is good and comes at a competitive price. However, there is a limited amount of color and finishes that you can achieve with the PLA filament. In total, Dremel offers 10 filaments. The last limitation that you need to know about is the files types that the 3D40 printer accepts. You will most likely be restricted to using Dremel’s software for the final slicing process. This is because the printer only accepts .g3drem files and not the industrial standard g-code. Experience users can look around on the internet for compatible software like S3D that will work fine with the 3D40 printer. Dremel offers excellent customer support. If any problem emerges during your printing, you can start looking for solutions by checking Help guides. If you can’t find a solution in the guides, you can call or send a message to Dremel. Helpful experts will contact you back and give you all the necessary information to solve the problem at hand. This printer comes with a lifetime guarantee. The company will fix the printer at any time without you having to spend a single cent. Dremel has a good reputation and is a household name in electrical tools. They are also the first household brand to make their own 3D printer for consumers. Dremel is known for their easy-to-use products, and not much has changed with the 3D40 printer. The Dremel 3D40 Idea Builder works flawlessly out of the box. You are not likely to experience any issues that might dampen your spirit as a newcomer to 3D printing after unboxing the printer. The 3d40 is a sturdy machine and provides reliable print results. Some rival 3D printers offer more flexibility than the 3D40 printer, especially in using various types of filament and a wide array of materials. Unfortunately, these printers don’t give you the same guarantee that every time you press to print, you will get excellent results. If you don’t like being so restricted, you can buy the FlashForge Creator Pro instead. You’ll have more learning opportunities with this printer and it will allow you to play around with some of the fairly complicated and more advanced 3D printing settings. Beginner 3D printers should look no further than the Dremel DigiLab 3D40 Idea Builder. This is the ideal 3D printing machine to get them starting out smoothly.